San Diego’s mid-city neighborhoods are getting a new, faster bus service this year. The idea was to create a bus line that mimicked the trolley, but cost a fraction of the price. But the mid-city project is much less ambitious than when it was originally conceived. Now that it’s been scaled down, it’s lost a lot of the very elements meant to make it attractive. “Bus rapid transit” (or BRT) has been a trendy planning solution for years, used in the U.S. and around the world to provide high-end transit at a discounted price. But SANDAG, the regional transportation planning agency, made concessions on some key elements when putting together its network connecting downtown, Escondido, South Bay, mid-city and the Golden Triangle – particularly on the mid-city line that connects SDSU to downtown. The concept of a fast and convenient bus that would lure new riders in the mid-city area began about 10 years ago, as the Showcase Bus Rapid Transit. It would have had lanes dedicated exclusively to the new buses and cyclists on El Cajon Boulevard and Park Boulevard, bypassing street traffic. And it would have ticket vending machines that would have allowed riders to pay before boarding, speeding up the process by freeing drivers from transactions and letting riders use both doors. That was in 2005, but SANDAG suspended the project following opposition from resident groups and businesses along El Cajon Boulevard, who didn’t like the idea of eliminating a lane of traffic. The El Cajon Boulevard Business Improvement Association surveyed local businesses and found 74 percent didn’t want to surrender a traffic lane. Stephen Russell, an architect, was executive director of the El Cajon BIA who later worked in Councilwoman Toni Atkins’ office when she represented the mid-city area. He said the project didn’t have the support it needed. Russell supports the current project even though he wishes it had the more beefed-up features. He thinks it will attract a new ridership that will become a vocal constituency for improved transit. “You’re going to see an incredible amount of activity, you’ll see more dense housing, and that will change the makeup of the electorate there,” he said. Initial cost projections of the line with dedicated lanes were $50 million, the Union-Tribune reported in 2003. That’s pretty close to the final cost of the current project, which came in at $44 million. SANDAG’s ridership projections for the new line predict a 27 percent to 63 percent increase over the existing local bus service. The mid-city line is expected to draw 7,000 to 9,000 daily riders by the end of its first year, according to SANDAG. The actual daily ridership of the 15 bus — the local line that runs more or less the same route — is 5,503 on average, according to the Metropolitan Transit System, which operates the service. When Does a Bus Become Bus Rapid Transit? There isn’t a universal definition of bus rapid transit. In fact, there’s a pretty heated debate over what gets to don that label. One school of thought, championed by the National Bus Rapid Transit Institute, a federally funded group operating out of the University of South Florida, takes a pretty straightforward view: BRT is transit on rubber wheels that increases ridership at a low cost. It doesn’t need dedicated lanes, and its strength is that it can be changed to fit a local environment. Most miles of BRT in America don’t have a dedicated lane, he said. “I try not to look at it that if you don’t have a dedicated lane, it’s a negative, and rather that if you do have a dedicate lane, that’s a positive,” he said. Then there’s the other school of thought: There must be a clear distinction between bus rapid transit and typical city buses. The Institute for Transportation & Development Policy, an international nonprofit, established what it calls The BRT Standard, which says bus rapid transit has four essential elements: dedicated lanes, pre-boarding payment, bus priority at intersections and platform-level boarding. There’s wiggle room within each category — for instance, a lane that’s simply marked for buses, versus separated and elevated busways — but some commitment to each is non-negotiable. Weinstock said pre-board payment, which the mid-city line also doesn’t have, is the second-most important element behind dedicated lanes. Using BRT to describe glorified buses, Weinstock said, creates local opposition to transit projects on the basis that they aren’t light rail, a criticism that’s been levied against San Diego’s new projects. “One reason people are focused on light rail and not BRT is because they haven’t seen true BRT,” she said. There are five U.S. cities with what ITDP considers true BRT: Las Vegas, Cleveland, Los Angeles, Pittsburgh and Eugene, Ore. San Bernardino is getting ready to open the sixth. She’s not swayed by scaled-down projects that promise to add essential features later. Los Angeles offers an interesting case study in the distinction between BRT and lesser fast buses. Its Orange Line is a fully recognized BRT project that surpassed ridership expectations and was found by UC Berkeley researchers to alleviate traffic on the 101 Freeway, and was later extended as a result. It’s complemented by the Metro Rapid, a series of bus lines that operate in mixed traffic that get most of their time savings by making fewer stops and taking advantage of transit signal priority, much like the Mid-City Rapid. So What Does That Make the Mid-City Rapid? SANDAG’s internal definitions recognize the difference between BRT projects and an improved bus line. The agency has referred to the new services that connect South Bay and Escondido to downtown via bus lanes on freeways as BRT. It distinguishes the mid-city line as a “rapid bus.” Once all the lines are operating, though, MTS will kill the distinction, and brand all the vehicles under a single identity, The Rapid. Appleyard said it’s ultimately semantics. Even the federal government seems torn. 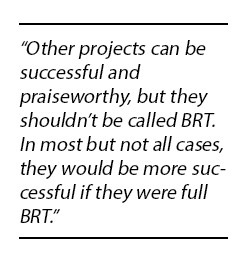 Basically: BRT is anything that’s good. But the FTA’s New Starts program, the one expected to provide half of the funds for the $1.7 billion Mid Coast Trolley project, requires dedicated bus lanes. No exceptions. Since that’s the program that can provide the most money to local projects, it’s fair to say the federal government is trying to incentivize projects with dedicated right of way, Hinebaugh said. The mid-city line got half of its $44 million budget from another FTA program, called Very Small Starts, which doesn’t require dedicated lanes so long as projects meet other minimum qualifications. The other half came from the county’s half cent sales tax that funds transportation projects, TransNet. Appleyard said there’s a spectrum of features that distinguish improved bus lines from one another, but the mid-city line has picked up the most important ones to improve ridership.